Whether it's Mother's Day, Valentine's Day, a friend's birthday, or simply because you're in the doghouse, put a smile on someone's face with a fresh bouquet of flowers. 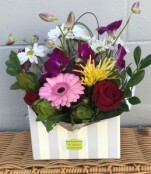 Get the pick of the bunch from Bunch N Judys Florist & Gifts we deliver flowers same day in and around Manoora. Please order before midday to guarantee same day flower delivery in Manoora.